A Russian remake of “12 Angry Men” is concept behind this Best Foreign Language Film Oscar nominee from last year. At 160mins, it’s an imposing epic length version of the 1957 film, which originally ran a scant 96mins. Under Mikhalkov’s rich directorial style and a dozen inspired performances, “12” is watchable for the original 96mins and most of the extra 54. The film has been described as a loose remake, or an inspiration from Bernard Rose’s original screenplay. Despite the added length, it’s as much a traditional remake as we see in Hollywood today. The concept and narrative structure is the same. We never see the trial, instead we meet the jurors once they've arrived in their sequestered room (a school gymnasium this time) to deliberate over the case of a young man accused of murder. In this case a young Chechnyan boy accused for killing his foster parent – a respected officer of the Russian police. The men are exhausted, home sick and ready to jump to their first knee jerk reactions to the case – a guilty plea. Eleven men say guilty, one doesn’t. Over the course of the day, one by one, the tide begins to turn against guilty. Two opposing steadfast personalities clash, in the Sidney Lumet version Henry Fonda was the voice of reason, and Lee J. Cobb as his stubborn foe. In “12” Sergey Garmash inhabits Cobb’s racist bully part and Sergey Makovetsky instantly expresses the warmth required to replicate the Fonda everyman persona. In between are a number of bravura moments, highlighted by Sergei Gazarov’s coy mindgame with the racist who claims to know his way around a knife. In a scene of wonderful dancelike choreography and editing Gazarov’s half-Chechen surgeon character turns the tables demonstrating how a Chechen uses a knife (Note to the audience, do NOT get into a knife fight with a Chechen). Mikhalkov’s directorial style has macho-masculine bravado. Visually Mikhalkov’s moves his camera around with confidence and lights and frames each of his men like they are the star of the film. Each character is important to him, each gets his dramatic speech which results in a tidal change of opinion and contributing to the impression of the case as a whole. Each actor is a force of nature, commanding the stage when necessary. It’s a guess, but the original play was called "12 Angry Men", for the simple reason of politically incorrect male superiority on the part of the writer. Why write a woman into a picture if there’s no chance of a romance? 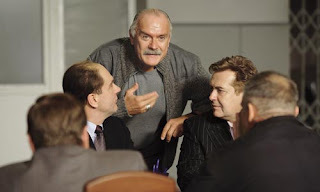 In “12”, men is not in the title, and so, a woman could have been cast, but Mikhalkov sticks with 12 males. His reasons take on greater significance in the dynamic of the room. The case could stand alone as a distinctly male story of father and son and the responsibility of men as protectors – a system which failed the boy. As the men wrestle with their duty as citizens and men to the boy, the finale takes on even greater emotional resonance. “12” is not perfect either. There's a predictability in how things will play out. We know each man will get his speech and the tide will eventually turn. It’s not a breezy 160mins either, the first 25 are a slog, setting up a tone of immaturity with the men - the school gymnasium easily distracts the grown men like attention-deficit children. The intention is good, but10mins could have sufficed. A stray bird which has flown into the room becomes a visual metaphor though not as profound or significant as implied. We expect the bird, which is even featured in the movie poster, to play a part in the story so there’s a lost opportunity to have this elegant, almost feminine presence, influence the decision of the men. The finale presents us with a wonderful denouement adding even more panache to Mikhalkov’s treatment of the original story. After spending so much time with the lifestory of the accused, in deciding his fate, for good or bad, one of the jury members brings up the responsibility the 12 of them have for the boy even after the trial is over. The final scene is not necessary, but one of inspired cinema with continues the story beyond the final credits bringing Bernard Rose’s original screenplay to a grander level of cinema. Enjoy.